Voters statewide who say there is a feud say 61 - 9 percent, including 67 - 8 percent among New York City voters, that Cuomo is winning. De Blasio did not work hard enough to convince state lawmakers to enact legislation important to New York City, 35 percent of voters statewide say, while 32 percent say Cuomo undermined de Blasio’s efforts. 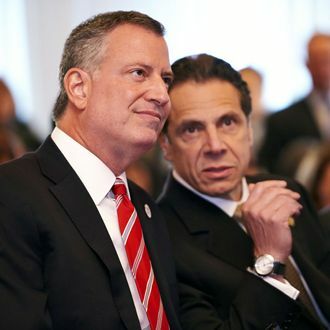 New York City voters are divided as 39 percent blame de Blasio and 38 percent blame Cuomo. In a statement to the New York Times, de Blasio spokesperson Amy Spitalnick doubled down on her boss’s June remarks about Cuomo’s taste for “revenge,” as well as his tendency to “inhibit the agenda that New York city put forward” in Albany: “If there are ways to work productively with this governor, we will do so. If New York City is getting the short end of the stick from the state, we will continue to call that out.” Cuomo declined to comment, though he did commit to a WNYC appearance to discuss the poll — before apparently canceling at the last minute.